Engagement is a crucial part of learning, but ensuring students are actively engaged is more complex than whether a student is paying attention or not. 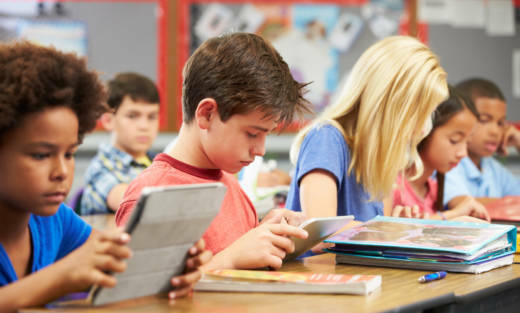 As technology has made its way into the classroom many educators describe how attentive students are when on devices, but a quiet, outwardly behaved student is not the same thing as one that is truly engaged. The kind of engagement that leads to learning is three dimensional. When Almarode visits classrooms he looks for behavioral, emotional and cognitive engagement at play together. He points out that on-task behavior is not a strong measure of learning. More than that, a student might behave, but be miserable. “Everything we know about the neuroscience of learning is that emotion drives cognition,” he said. But even if a student is behaving and feels good about it, if he or she isn’t actively making meaning out of the information, then active engagement still hasn’t been reached. When Almarode visits classrooms he looks for eight different qualities that indicate students are engaged. It’s undoubtedly hard to get all eight measures of engagement into every classroom activity, but research by John Antonetti shows that at least three can make a big difference for how much kids learn. “In classrooms where you had at least three characteristics in each assignment students demonstrated sustained cognitive engagement between 84 and 86 percent of the time,” Almarode said. When only two characteristics were present students were only cognitively engaged about 16 percent of the time, and that number dropped to less than four percent when only one characteristic was present. “As a teacher, as you design a task you need at least three of those characteristics in there,” Almarode said. More than that, the characteristics should be observable to anyone who walks into the room. For example, when Almarode walks into a room on a visit, he should be able to ask any student what the class is working on, what the teacher’s expectations are and how it will lead to learning. He might also look for whether students are talking about the topic and bringing in their own experiences. These observations show him students are on-task, as well as emotionally and cognitively engaged. The other thing he watches out for is whether the activity meets the expressed expectations. For example, if a student says the activity is to describe the phases of the moon, but the actual task only requires him to match pictures to vocabulary, then the activity isn’t actually requiring students to describe. In that example, the cognitive engagement expected did not match the cognitive engagement Almarode saw in the work students were doing. Effective feedback on work is another crucial aspect of three-dimensional engagement. Almarode knows how difficult it is for teachers to grade all the assigned work, but he’s also convinced by evidence that shows immediate feedback is crucial to cognitive engagement and thus learning. That feedback doesn’t necessarily mean returning fully graded papers the next day. Instead, after students turn in their papers, Almarode suggests handing out three papers that demonstrate what it looks like to have met expectations, to still be developing, or to be below expectations. Alternatively, the teacher could hand out a rubric and ask students to score a work sample. Both of these strategies give students a sense of how they performed, and the feedback comes while the process of writing is still fresh. “Give them something to actively engage with immediately,” Almarode advises. This feedback strategy doesn’t mean teachers shouldn’t assign other work, but he suggests doing more peer feedback sessions or dialoguing about the assignment to free teachers up for high quality feedback on fewer assignments.